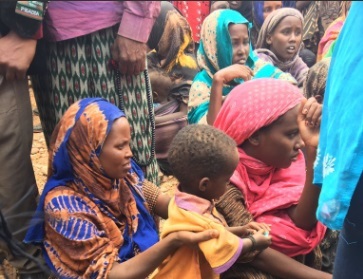 Denmark has decided to earmark 25 million kroner in aid to help alleviate the ongoing drought in Ethiopia that has left 8.5 million people in dire need of humanitarian help. Nearly half of those in need of assistance are pregnant or breastfeeding women and children. The development minister, Ulla Tørnæs, visited the Gode in the eastern part of the country this week to take stock of the situation. “The situation here in Gode is very serious, and it has been so for a long time. There are great human consequences in this area, where food insecurity is high and where many people have been displaced from their homes because of drought and basic food needs,” said Tørnæs. Denmark has long supported a World Bank-led program to help Ethiopia to better handle droughts. The 25 million kroner is going to a program dedicated to pregnant or breastfeeding women and children under five years of age. It is expected to impact over 150,000 people, 100,000 of which are children. As part of the unveiling of the 2018 budget proposal yesterday, the government presented the biggest humanitarian budget in Danish history. Earlier this year, Denmark chipped in 10 million kroner to help alleviate the problem in Kenya.